SkyVenture is amongst one of the pioneers in wind tunnel manufacturing. They constructed their first tunnel in Orlando in 1998 and it still operates today. This tunnel was a 12 foot open flow model. As the industry has exploded, larger and larger tunnels have been built. The largest in operation today being a 17 ft diameter model built by Strojirna Litvinov. The most popular flight chamber size across all manufacturers model is 14 ft in diameter. SkyVenture (they design and build the tunnel technology) and iFLY (they are the brand that operates the tunnels) have a new tunnel model on the horizon. Most recent iFLY locations have been 14 ft models, but that is about to change as a bunch of these new 12 footers are right around the corner. The indoor skydiving industry is growing fast, really fast. Right now Indoor Skydiving Source lists 77 publicly operational wind tunnels world wide. There are another 38 under construction and announcements for another 34. It wouldn't be surprising if the total number of tunnels doubled in the next two years. Check it all out in the wind tunnel database. What does that mean? Well it means that the number of prime locations with large surrounding populations and space to build is slowly decreasing. We've written about the future of vertical wind tunnels, and now we are seeing some of these things happen. 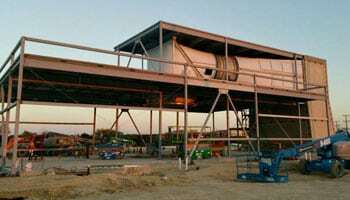 Building 12 foot models will have an obvious cost advantage when it comes to construction and operation. A 12 foot tunnel can support just as many flyers and for the majority of customers (proflyers/skydivers might still prefer the larger tunnels) the experience will still be great. 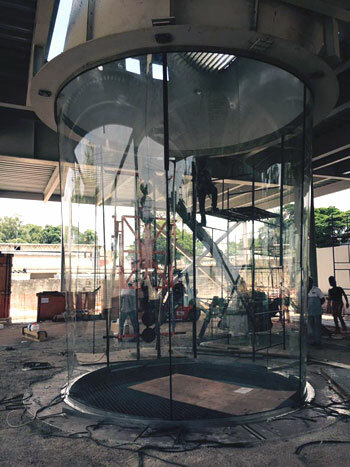 High quality, round glass flight chamber. What We Want to Know! What will the air quality be like? Single loop recirulators are notoriously smooth! What about top speed? How fast will these machines be with only two fans? How easy will it be to reach the low side of the turning vanes? They look pretty close! Even though these tunnels are a couple feet shy of some of the other new tunnels like iFLY Portland, they still look great. We hope this new generation of iFLY tunnel is a success and the local flyers enjoy flying in them. Let us know your thoughts in the comments! I see there is a ifly opening in king of prussia, pa. However, I can't find any information on when it will be opening. I keep seeing articles about ifly facilities opening around the country but still nothing on the kop facility. Can you give me any updates? Tara, anything new that we find out about King of Prussia is posted on this page https://www.indoorskydivingsource.com/tunnels/ifly-king-of-prussia-philadelphia/ You can subscribe there too and we will keep you updated. Please let me know when you open in Kansas city.